Newsagent, Pagham. The 1930 edition of Kelly's Sussex Directory (issued in June) has no entry for George Morris, but he is listed in the 1934, 1935 and 1938 editions, the last describing him not only as a newsagent but also as the proprietor of the Phoenix Bookstall. 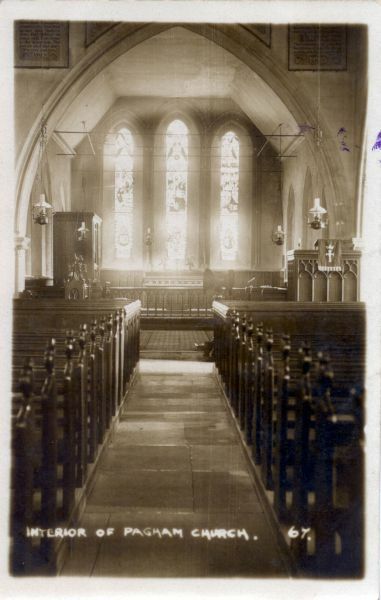 The sepia-tinted real photographic card of the interior of Pagham Church shown above is hand stamped on the back in purple ink "G. Morris, Pagham". A 1929 date has also been added in purple, perhaps by Morris himself. The card has a "home-made" feel about it, which suggests that Morris may have printed it himself. The number of the card (67) suggests that it is one of quite an extensive series, but no other cards of the same design have been reported. An unnumbered, coloured sepia card of Nyetimber windmill has been found, however, which has a printed label on the back "Published by G. Morris. Pagham". It was postally used in 1929 and, unlike the card reproduced here, has a machine printed caption. The rarity of the Morris cards suggests that they were sold in very small numbers, perhaps just at his shop, and then possibly only for a year or so. No biographical information about George Morris has been unearthed.